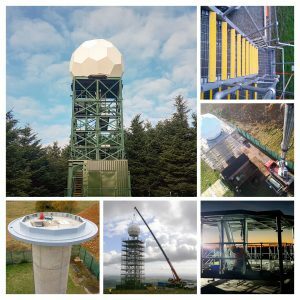 The Met Office’s National Weather Radar Renewal Project has recently won a prestigious award and we are thrilled to have played an important role. LARS was one of the companies working alongside the Met Office and the Environment Agency on the project, which took seven years to complete and cost in excess of £10 million. And it was all worth it, as the project has been recognised at the recent Annual Environment Agency Flood and Coast Project Excellence Awards. Four hundred people gathered recently at the Telford International Centre to celebrate flood and coastal management successes. Over 120 entries were narrowed down to just eleven awards, including the award for Asset Management, which was presented to the Weather Radar Network Renewal team. The Asset Management Award is presented for ‘Doing the routine brilliantly’, recognition of the best practice in routine maintenance and emergency works to existing assets. The project was introduced to refurbish and upgrade sixteen weather radar systems in the UK. The final two sites – one at Munduff Hill, East of Loch Levern near Kinross, and one at Druim a Starraig on the Isle of Lewis – have only recently been completed, and we are delighted to have played such a pivotal role. The LARS team has thoroughly enjoyed working with the Met Office and the Environment Agency, as well as the other companies involved alongside. All involved have carried out fantastic work at the various sites, which are spread right across the British Isles, and we are pleased to say that all sixteen sites now adhere to the strict health and safety standards required by the Met Office. The weather radars provide real time information to help monitor and forecast heavy rainfall. The programme of improvements helps to address current network challenges; ensure the radar service will have the ability to meet future requirements, such as hydrometeor classification; and extend the life of the network by between fifteen and twenty years. We were responsible for the infrastructure upgrades to thirteen of the sixteen sites, where we assumed the role of Principal Contractor. The scope of works was varied and included undertaking dimensional surveys of the existing tower at each site; the preparation of designs and drawings for steelwork connections, balustrades and waterproofing; the fabrication of steelwork required for the upgrades; the removal of existing decking plates and ladders; the installation of new platforms and new access stairs and balustrades (where required); and the provision of new self-opening access hatches. Most of the steelwork fabrication was carried out in our fully-equipped, in-house fabrication workshop and is all CE Marking accredited. The sites certainly proved to be a change of scenery for the team, and they did pose some very different challenges. The site on the Isle of Lewis, for instance, is pretty remote, but nothing we’re not used to – we have shown over the years that we can work anywhere we are required to be, whether on land or offshore. So we would like to extend a huge thank you to the Met Office for their continued support – and to be associated with such a prestigious award is the icing on the cake and makes us all very proud.